We’ve asked Northern Ireland’s leading road-trippers and adventure-finders NI EXPLORER to put a few of our Kia models to the test. They’ll be making the most of each model’s features – from the streets of Belfast to the Mourne Mountains, the Causeway Coast and everywhere in between. Please note, our recent giveaway is now closed (as of Monday 1st April 2019). Thanks to all who entered, the winner is Suzy Cavill. We’ve seen them on the roads around Northern Ireland, but never actually driven an electric car ourselves. So it was fitting that our first electric experience would be in Kia's first UK-available electric car. PHEV stands for Plug-in Hybrid Electric Vehicle – meaning it has both an electric battery and unleaded petrol engine to power it. In petrol mode, you can get up to 58.9mpg, while the battery also gets charged as you drive. Then in electric mode – after charging up at home or fast-charging at any of the eCar points around Northern Ireland – it has a range of 36 miles. 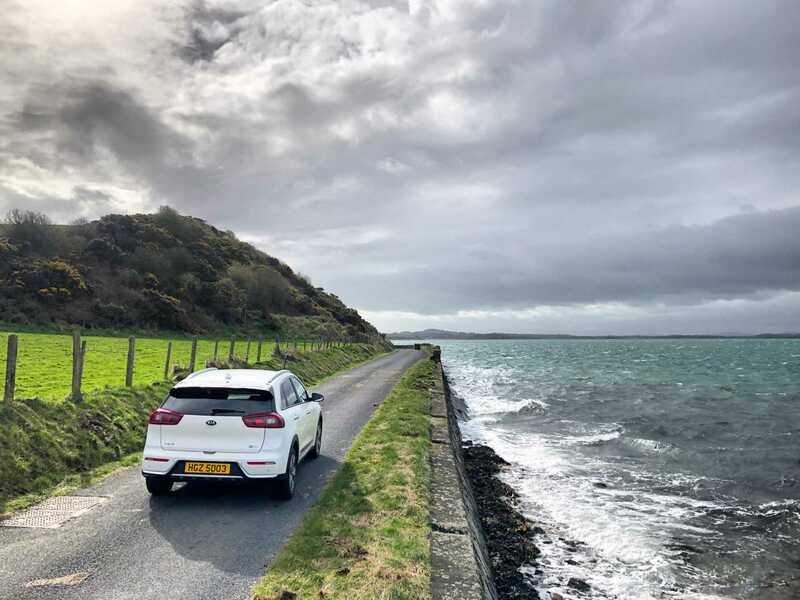 Looking at a map of Northern Ireland and what points were within a charging radius from Downeys, we headed off along the scenic Ards Peninsula, stopping off at a few well-known points along the way. At around 20 miles from Downeys' Newtownards showroom, this was the perfect place to stop and plug-in. The eCar charging point is handily located in the Exploris Aquarium car park. ...and the rest of the scenic drive back up through County Down. More time needed to explore this route again - so much to take in along the way! Needless to say, the Niro PHEV comes with all the technology and trim options we’ve become accustomed to in the Kia range. Check them out and pricing options here. Also, between our Strangford coastal adventure and writing this, Downeys have just received the fully electric ‘eNiro’ – which has an incredible range of 282 miles at full charge. We’ll insert a link here once we’ve had a longer-distance adventure in that one! Fancy trying out the Kia Niro yourself? We'll give you one of ours for 48 hours, plus entry to Exploris Aquarium for 2 adults and 2 children, with a £50 voucher for lunch in the Portaferry Hotel. Enter via our Facebook or Instagram giveaway posts before 11.59pm on Sunday 31st March 2019 for a chance to win. 1. Promotion is run by Downeys Cars (Newtownards) (hereon referred to as 'Downeys') in conjunction with Exploris Aquarium (Portaferry) and Portaferry Hotel (Portaferry). 2. Giveaway open to Northern Ireland residents aged 18 years and over, except employees, families, agents or anyone professionally connected with the parties mentioned above. 3. By entering, you agree to be contacted by the parties involved about the giveaway and for the parties to use the information submitted for any purpose in connection with the promotion only. 4. Giveaway starts on Saturday 23rd March 2019 at 9.00am and closes on Sunday 31st March 2019 at 11.59pm. - ‘Use of a Kia Niro Hybrid car for 48 hours’ provided by Downeys. The car will be provided with a full battery charge which covers approximately 30 miles travel, as well as a quarter tank of unleaded petrol. If for any reason this car is not available, Downeys will provide another car of similar spec. The winner will be required to charge the car at the e-Car terminal in Portaferry. An e-Car Access Card will be provided by Downeys for use in this 48 hour period. The car must be picked up from and returned to Downeys showroom by the winner. The car will be insured by Downeys – winner must have (and bring with them) a valid full UK driving license and agree to the insurance terms provided by Downeys. Transportation to and from Downeys is not included in this promotion. - ‘A family pass to Exploris Aquarium’. This includes free entry to Exploris for 2 adults and 2 children. Any additional adults or children in the winner’s party will need to be paid for by winner. See https://www.explorisni.com/visit-us/prices/ for full admission pricing. The winner’s name and contact details will be passed onto Exploris Aquarium by Downeys - winner must present valid photographic ID on site to avail of free admission for their party. - ‘Lunch at the Portaferry Hotel’. This will be a voucher to the value of £50 for the Portaferry Hotel, which will be provided by Downeys at the time of collecting the Kia vehicle. Winner will be required to pay any balance direct to the Hotel, if the bill is more than the £50 covered by the voucher provided. 6. Entry to the giveaway is by simply mentioning (on the respective Downeys’ Facebook or Instagram giveaway post) who the entrant would bring if they won. 7. Only one entry per person, per channel (i.e. someone may enter maximum twice, by commenting on both Facebook and Instagram). Winner will be selected at random across all entries on Facebook and Instagram. 8. The winner will be announced after midday Monday, 1st April 2019 via the Downeys website (a link to this will be posted on the Downeys Facebook and Instagram pages). Winner will be contacted via private message on the respective platform that they entered on, and will have 48 hours to accept prize, otherwise a new winner will be drawn. 9. The winner will agree a date to take the prize, directly with Downeys. The winner’s contact details will then be passed to those parties involved in the giveaway. Prize must be used within 2 months of the winner being notified they have won. 10. Prize is not transferable and no cash alternatives in whole or in part are available. 11. This promotion is in no way sponsored, endorsed, administered by, or associated with Facebook or Instagram. By entering this promotion you understand that you are providing your information to the parties involved and not to Facebook or Instagram. Your information will not be used for any other purpose than to be contacted if you have been chose as the winner. 12. Downeys and the parties involved reserve the right to vary, alter or terminate this promotion due to unforeseen circumstances. The decision of Downeys is final and binding and no correspondence shall be entered into.